We arrived in Boston on Wednesday, escaping the first winter storm in Denver (just two days earlier it was still shirtsleeves weather). Yesterday was our first day at the conference, with two interesting presentations. The first one was by Tim Parks, the Distinguished Speaker for the Italian Language Division. In addition to being a well-known writer, Parks is a translator and teacher of translation. In his first presentation, Retranslation of Classics for an Authentic reading Experience, he spoke of the challenges of translating such a well-known and politically loaded book as Macchiavelli's The Prince. The presentation was excellent, with several interesting examples from older translations as well as Parks' own recent one - and also from translation from Macchiavelli's Italian into modern Italian. 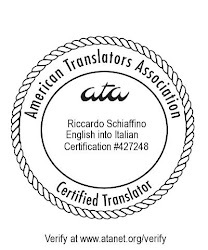 Parks will have another presentation this afternoon, Style in Translation (speaking, this time, on the translation of modern Italian authors). The second interesting presentation of the first day was by Tuomoas Kostiainen, on Working with Non-Trados Studio Clients/Translators, i.e. which workflows are available for translators who work in Trados Studio, but have to deliver translations to customers who are not working with Studio as yet.